The team of McEvoy and Cloutier produced many top selling poker books, and this is yet another edition in their series. All of the books produced by this team are well written and contain sound, yet fairly straightforward and basic poker instruction. In the case of their book on Omaha, while the level of instruction is pretty basic, like the other books, the play of Omaha even these days is more basic in general than Hold‘em, so this book will be of interest not only to players new to Omaha, but intermediate players as well. This book certainly won’t take you to playing championship poker in any sense, as they are all pretty much introductory books on their topics. McEvoy and Cloutier may want you to believe that you will play like a champion after reading their books, or even play like a good player, but the reality is that you will only have grasped some of the simpler concepts. However, grasping the simpler concepts is a necessary step to a player’s journey to playing good poker, and these books are at the very least very good introductions to the game. 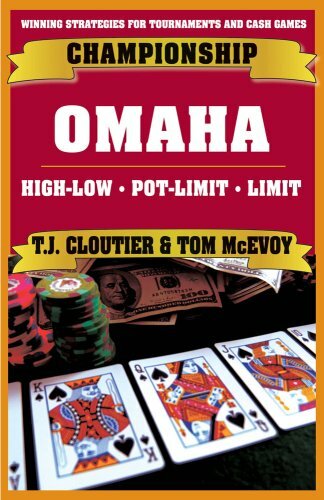 There are a lot of players who may be good or very good Hold’em players, but may not be that familiar with Omaha, and in that case this is definitely a good book to pick up. It is rather pricey compared to a lot of other poker books, but is generally worth the money. As always, the material from McEvoy and Cloutier is clearly written and generally sound. They take you from the much more difficult matter of choosing starting hands in Omaha, and proceed through the flop, turn, and river, offering players some good introductory strategies all along the way. There is also a lot of other general advice concerning matters that Omaha players need to be aware of, like the dangers of slow playing, the necessity of folding big hands that you’d never throw away at Hold’em, how to play against both loose and tight opponents, how to read the board properly, avoiding playing danglers, and much more. As always, McEvoy and Cloutier provide many hand examples to demonstrate the various concepts and strategies taught throughout the book. The dynamic duo of poker are well known for the clarity and ease of their teachings, and this is one of the big reasons why this and the other books in their Championship series are well worth the extra price for those new to the form of poker that each book teaches. If you are new to Omaha or only know a little and are looking to expand your knowledge of it, this is a very good book indeed. If you are already experienced with Omaha but are looking to take your game to the next level, this book can be a good bridge to get you to where you can move on to some of the more advanced texts on Omaha.